Ok this is going to be an interesting blog post. Let’s talk about ex’s…our ex-men. Similar to the popular Marvel Comic, X-men, ex-boyfriend/lovers can be quite comical (see what I did there?). For a lot of us bringing up an ex is a negative space that we want to push into the far back of our mind or even to the point where we need Will Smith to Men-In-Black Style erase our memories from that relationship. I’m going to get a tad bit personal, because I ‘ve been kind of coy about my personal life and give a shoutout to an ex-lover.I don’t talk about my love life on my blogs or barely on any social networks because quite frankly, it’s no one’s business. Not trying to be rude, so let me explain. When you are in a relationship and it is broadcasted, somehow or another it becomes EVERYONE’S business who you are with and the status of your relationship. It seems like when everything is good people are inquisitive and then when things go sour, everyone wants to know what happened? So this time around, I’ve kept very quiet, to myself about my “dating life” because honestly if I am not getting married or engaged I really don’t want to overhype what I don’t know for sure is the real thing yet, and I have my EX (s) to thank for that. I want to dedicate a whole blog to my ex, because this taboo subject should be full of boo-hoos and voodoo dolls with pins in them. The older I get the more I realize I don’t hate my ex, I don’t even dislike him, and I am actually in a great space to speak about him. How did I get here? How did I get to the point of forgiving and living? Easy answer…because he was everything I ever wanted once upon a time. How do people bash and spew hateful words at a so-called “ex” when this was once someone you deeply loved and desired? I could never understand that, but have I said some hateful stuff in the past? Yes! Have I wanted to rip up all the pictures we ever took, make a burn book, and tell the world how much of jerk he is and warn ladies all over the world “Don’t Date Him”? Yup…but I didnt. I’m not gonna sit here and have a Taylor Swift “Never-Ever Getting Back Together” party…because it wasn’t that simple. I, Kiwi, when I date I pick and choose who I want and it becomes serious and long-term. For me to bash someone that I loved with passion and affection is ridiculous. It make me look like an idiot because why would I date someone for so long, to ultimately hate in the end because it didn’t work out? Yeah I can hate that my heart got broke, torn, stomped on, and shrivel to the size of Mr.Grinch’s heart within an instant…but that doesn’t change the fact that I loved him. It doesnt change the fact of the memories that we created. Him & I…the journey and the happy memories I cannot erase. I have to to realize this was someone who wasn’t just a boyfriend at the time…we were partners. We said the word “love” with meaning and truth, not because it’s what you are supposed to say. A person that yes we talked about getting married, having kids, and having a future because that was the long-term goal. This was someone when you associated him, my name would come up and vice versa for me. This is a person where our families expected to know about each other’s well being and even became apart of the family. I am not gonna sit here and say that my ex and I had a fairytale relationship either. There were hardships, drama, people came in to conquer and destroy us – with their opinions to ultimately break us up. In the end, I think that is what happened – too many people got involved and time and other’s people’s rationale of how our relationship should be going broke us up along with a combination of other life occurrences. People stopped trying as hard, things taken for granted — and a little love lost because the grass has to look greener on the other side. The finale commitment to happily ever after was put to a halt because honestly…both of us weren’t mentally mature for each other like we thought. We loved each other but we didn’t know how to communicate it to keep it going at the time. We were scared, confused and possibly selfish to love properly at the time. See when you are in love you love with your heart not with your mouth or your eyes. It’s easier said then done, but I learn something. Love isn’t just a verb, it’s something that makes you feel alive. So with the happiness came the heartbreak – and both emotions made me feel alive. So I have to shoutout to you ex-boyfriend, you taught me the opposite of hate even after you. You taught me that love is still makes me alive, even if it’s without you. You taught me that my heart still beats, even if it took longer to heal than I thought. You taught be careful, maybe too careful because I ended up pushing away a few good guys because of what you did to me. You taught me that with or without you, I am still me. I loved being with you, but I love me single too! I forgot that sometimes, how to be single, just enjoy myself – that I didn’t need your relationship title to jusitify my existence (no offense). Most importantly, I want to shout out my ex because he is human, not a bad guy – just maybe bad timing for us. Our personal growth and development was once in alignment and then it got off track…it happens. So shout out to you, once the love of my life and now someone who used to be a big part of my life and still has a space in my heart. I’m not bitter, I am better because of you. Thank you! *This post was dedicated to one of my ex boyfriends. I didn’t say which one so…to whom it may apply to. 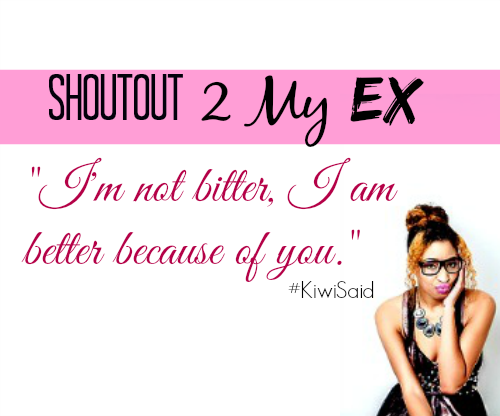 Post was inspired by singer Kissie Lee’s new song Shout Out To My Ex! Thanks for the inspiration girl, the video is too cute, reminds me of something Katy Perry would do! Do you want to shout your ex out? Have anything to say to him if you could? Let me know! I have always learned a lot about myself and how to deal with life from exs. I’m with you. Learn, be appreciative and move on. Good for you getting pen to paper on this! I don’t really have anything to say my ex-es. When it ended it ended – they don’t know what they missed with me! but it was all meant to be so I could wind up with my hubs! Relationships definitely teach you something about yourself. Good or bad, there’s takeaway from every single one of them. I’m friends with several ex-boyfriends. I’m fine with it, and my husband is fine with it (he’s friends with at least one ex-girlfriend.) It didn’t work out for a reason, and once we all got past the hurt, we found we could still be friends. What a sweet post! Cause you could have ripped your Ex a new one! Love this post! I learned a LOT from my first so called “marriage”. We might have been married on paper, but that was it. Other than that it was a stepping stone to become who I am today. To realize that I don’t NEED someone in my life! I am very thankful for the lessons I learned from that relationship otherwise I might not realize what an awesome husband I have now! I’m loving this positive vibe I’m feeling from your post! You GO girl! Over the years I have grown to forgive and forget all of my ex’s , including the EX HUSBAND! It’s crazy how you look back and realize so many different thing from the past relationships you are in. I learned so much especially from being married at a young age. I think exs are how we determine what we really want in life and relationships. Yes, for sure! I’d love to zap an ex out. What a great idea. I don’t think I would be that nice to my ex. I am at the point, 8 years later, that I realize that he served a purpose. Without him, I would not appreciate my husband the way that I do! I love this! Such a healthy attitude! This made me laugh! I love this post! I have to agree 100 percent of what you said! I need to share this post with my niece. She totally needs YOUR attitude! She’d get alot further if she did! Great post! You have a great attitude,saying that my e is an ex for a reason and i like not to think about the past ex lol. I am so thankful that I don’t have to worry about this. What a great reminder to empower ourselves. I actually get along with my ex and for good reason. We have a daughter together and I think to raise her properly it is good for us to converse and get along. This was a fun post! But very serious too. I don’t have very many exes, but I am one to just move on and not look back. they always want to either come back or remain in my life in some way. But you are right….never bitter….just BETTER! LOVE IT! I am not bitter, I am better. Great words of wisdom there! Relationships can be so complicated. I think it’s important not to bash the ex though too. I’ve never understood disrespecting someone who was once upon a time so important. Glad you are in a good space about your ex. Don’t have anything I would say to my exes. This is sooo true. I never understood how people could love someone so deeply that they would do some crazy stuff and then when they breakup they’re all over Facebook trash talking them. Makes them look immature not the other person, in my opinion. Though it’s not always easy not to be mad/bitter/angry at someone, really the only person that hurts is us. Glad you’re getting over the situation and leaving room for a healthy relationship to come. I think we all learn things from our exes. Sometimes they’re about others and sometimes they’re about ourselves. This is was a really sweet post. I am thankful for all of my exes because they helped shape who I am today. I’m not on bad terms with any of my ex’s, but let’s be honest, they were all prior to social media. I learned something I wanted in the next boyfriend and something I didn’t from each one. That is a great philosophy and very healthy way of looking at it. Communication or lack of it seems to be the downfall of many relationships, not just girlfriend/boyfriend. Now that I’m married and have been with my husband a number of years I spend very little to no time thinking about past relationships. They’re exactly where they’re supposed to be – in the past. Good for you that you have moved on and that you are able to send shoutouts with no feelings attached. Most women aren’t that healthy. It’s great to have no hard feelings and be free of hate. Each relationship helps us grow in some way even if it isn’t obvious immediately. It’s great that you have grown from your’s. I am still at least cordial with most of my exes. There are only a couple that I really just care nothing about ever seeing again. Great post! It’s refreshing to see someone who can talk with kindness about their ex and the past like you do. Definitely a great way of looking at things. I feel like every ex is an ex for a reason. They’re all building steps for the people we become (or became). I have definitely learned the lesson of being better, not bitter. It’s a growth process, for sure. Being able to look at my exes without animosity and anger is a beautiful thing. I’m much better partly because of the experiences with them. I met my husband when I was only 19 years old and married him shortly thereafter. As a result I do not have an ex lover stories to share with the world. I enjoyed reading your perpective on exes. I love that you are so civil about your exboyfriends! I have to say I agree though; I know my exboyfriends have all taught me different things in life. And for that, I am thankful. I agree that it just takes too much effort to hate your ex. Glad you are in a better place now. I don’t think that I would have anything nice to say with my ex. I’d rather shoot him than shout out to him. This was great!!! I absolutely feel the same way about posting bout my relationships! Lessons learned, the next time I post it will be my engagement ring! Real talk! And I feel you! I don’t hate any of my exes. I loved them, and it simply didn’t work out. But the lessons I learned were priceless!